Join the party this Wednesday evening from 6:30 to 8:30 at Esquivel and Fees Jewelry Store in the Village where you will find the most unique pet themed jewelry ever! 20$% of sales benefit Houston PetSet and a special Houston PetSet key ring, designed exclusively by Esquivel and Fees will also be available for purchase. Lite bites and wine will be served. 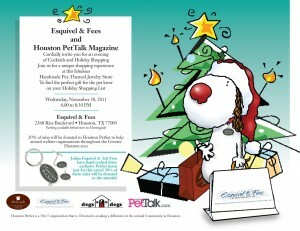 Stop by and select a special gift for the pet lover on your shopping list! !